During the past decades the findings of scientific ocean drilling expeditions have fundamentally changed the way we look at our blue planet. Today we have a much better grasp of how processes like earthquakes and tsunamis develop; ocean drilling made it possible to prove the theory of plate tectonics and we know a lot more about climate change and the limits of life deep below the seafloor. However, many issues remain to be solved. Hence the launch, on October 1st, of a new era of ocean research drilling: over the next decade, the International Ocean Discovery Program (IODP) will focus on scientific challenges that are of immediate interest to society. At an international media conference held at CNRS in Paris today, leading IODP scientists presented the new research program, which was launched on October 1st. "The International Ocean Discovery Program is a major geo-scientific research scheme devoted to exploring the Earth beneath the oceans, which cover more than two thirds of our planet", says Dr. Keir Becker, a marine geologist at the University of Miami (USA) and Chair of the IODP Forum. "With modern drilling vessels equipped with cutting-edge research technologies we shall focus on four research themes: climate and ocean change, the limits of life below the seafloor, processes deep within the Earth and their impact on the Earth´s surface, and processes causing hazards on human time scales." The International Ocean Discovery Program will build on the experience gained in previous projects such as the Integrated Ocean Drilling Program (2003-2013). As in the last decade of ocean drilling, the new IODP brings together scientists from the US, Japan, Europe and Canada and associate members (China, South Korea, Australia, India and Brazil). It is a truly international and interdisciplinary, worldwide program. "Europe plays an important and very special role within IODP", Dr. Gilbert Camoin, a geologist, CNRS researcher based at CEREGE-CNRS (France) and Director of the ECORD Managing Agency, pointed out during the press conference. CNRS is a key actor within the Agency as it oversees European participation in ECORD. It is the representative organization for Europe, while the US is represented by NSF and Japan by MEXT. Currently 17 European countries and Canada are united under the umbrella of the European Consortium for Ocean Research Drilling (ECORD). "ECORD aims to organize one expedition annually,", adds Dr. Camoin. "These expeditions will be special in that we shall explore ocean regions where the US and Japanese drilling vessels, JOIDES Resolution and Chikyu, cannot operate, for example in the ice-bound Artic and Antarctic waters. These areas play a major role in global climate change. However, there is a lack of data because until now only very few drilling expeditions could be carried out in these hostile regions." "Scientific drilling proposals arising from the scientific community are the essence of the IODP", says Dr. Carlota Escutia, a senior researcher at the Spanish Research Council and Chair of ECORD´s Science Committee. In addition to the scientific challenges, the new era of ocean research drilling provides great opportunities for both experienced and younger scientists. 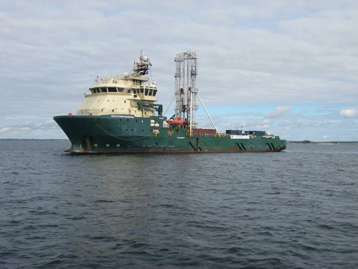 European and Canadian scientists are entitled to work on the Japanese and US drilling vessels, in the same way as US and Japanese scientists will take part in ECORD-led expeditions. Young scientists especially will be able to train with colleagues from other disciplines, countries and cultures at a very early stage of their career."